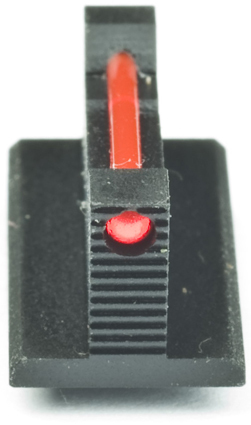 The low profile rear sight is model 018-014. Use the model number 018 at Dawson`s webpage. Using the parts search you can go directly to these sights and see all available options. 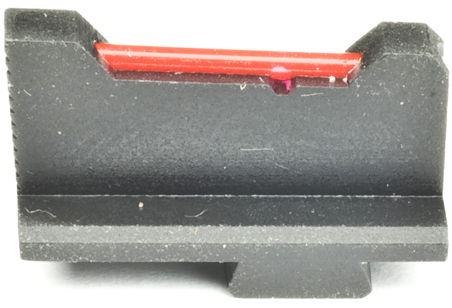 The front sight is part number 021-026. Synopsis: awson Precision is famous in the shooting community by providing some of the best adjustable sights available. A couple of years ago they developed some traditional not elevation adjustable type sights. 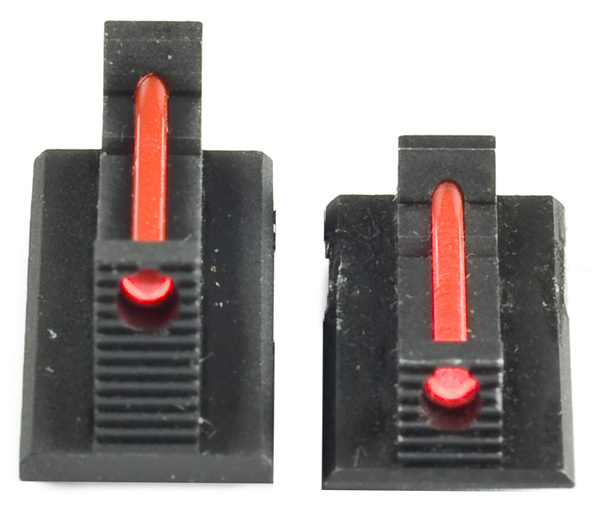 The 021 & 018 sights are available as separate front and back sights and can be purchased individual or as a pair. Each is available in plain black, fiber optic and night sight versions. The rear sight employs a set screw that will hold it securely in place but can be loosened to help aid in windage adjustments. This type of sight is suitable for a pistol that is used for duty or carry use during the week, but ready for any of the shooting games on the weekend. The slicked back rear with a serrated shooting face means that this sight is a fast snag free design that won't show the sun's glare in bright conditions. Pleas make sure to note that this rear requires a .205 tall front sight. 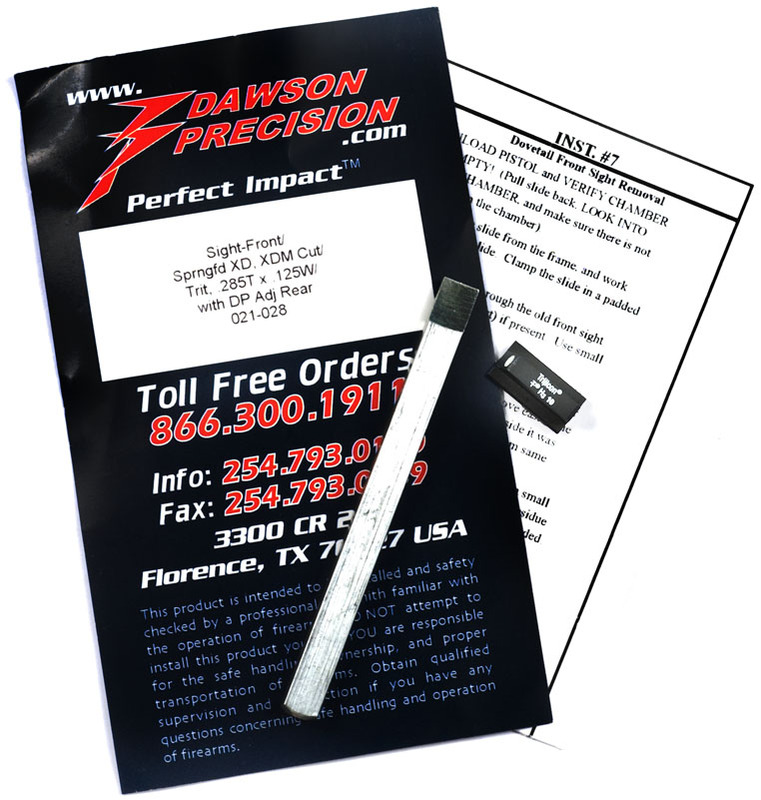 All Dawson Precision sights come in zip lock type plastic clear baggie. Along with the sights are two paper inserts and some type of aluminum installation punch. From left to right are the main merchandising placard that lets you know what model and version of the sight you are getting. 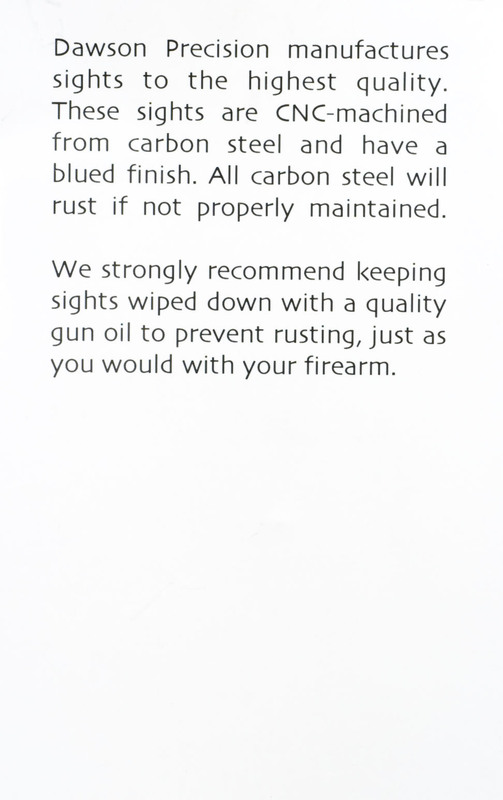 The middle picture is the back of the main insert reminding you that even though Dawson manufactures a quality product if not cared for the sights can rust. Each sight will also come with some specific installation instructions that will be particular to the sight and gun model. 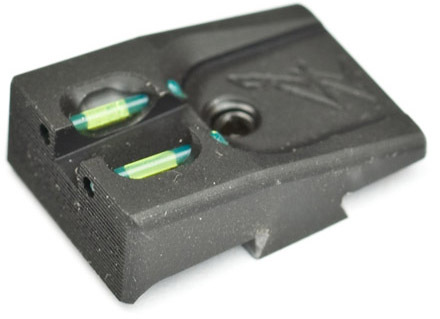 The Dawson Precision 018 rear sight might look familiar to the Springfield Armory XDM owners. The rear sight is the same design as the factory XDM sight. 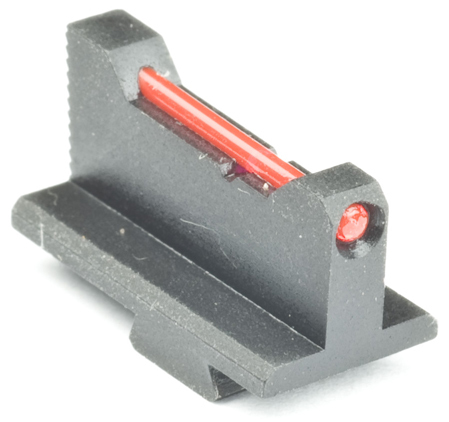 This sight will also work with the classic XD line as well but not recommended for the XDS pistol. The long rear sight will hang off the back of the slide. 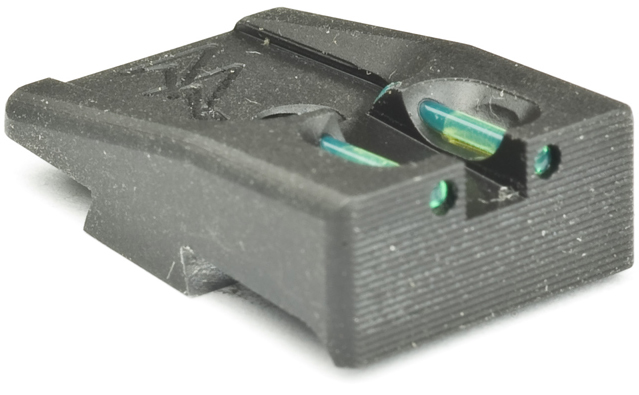 The rear sight features serrations on all of the different versions, fiber optic, black and night sight. These serrations will help keep the sun from washing out your sight picture in bright days. Dawson offer a bunch of different options of these 018 sights and at first can be overwhelming. Do a search at the Dawson website using the model number 018 and you will see every 018 rear sight Dawson makes. All 018 XD Springfield rear sights are this same basic shape and XD versions are .225 tall. Each one will require a separate .205 tall front sight. When you read the description you will see Opt/Trt/Blk. This means that particular 018 is Fiber Optic - Tritium night sight or Blacked out. .225T means that the sight is .225" tall. The .115N or .125N options are talking about the opening between the rear sight blades. A smaller sight opening can be potentially more accurate, while the wider opening can be faster. This is the Dawson model number 021-019 front sight. 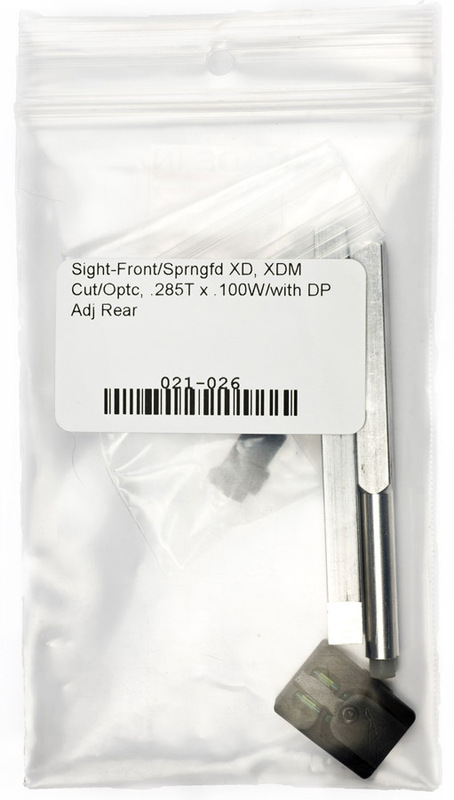 The front sight will fit both the XD and XDm series pistols. 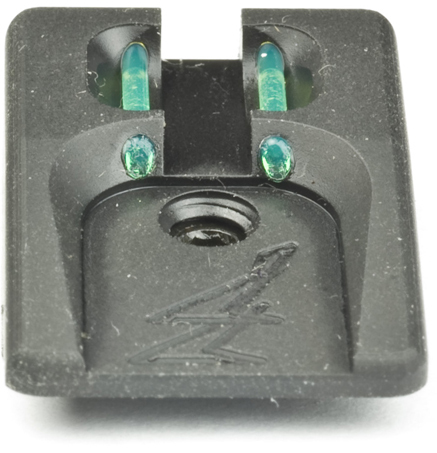 If you can find a comparable rear sight it will also fit the XDS pistol as well. Dawson recommends paring this front sight with a .225 tall rear sight. If you use Dawsons webpage to search for the 021 front sight you will be able to see all of the 021 options. This can be overwhelming but this will help you choose the right one. Each 021 front sight is the same basic shape. When you read the description you will see Opt/Trt/Blk. This means that particular 021 is Fiber Optic - Tritium night sight or Blacked out. .255T means that the sight is .205" tall. The .125W is the width of the blade. In theory a skinnier blade can be more accurate since it is a finer point. Were a wider blade can be more faster. Also based on your shooting preference you can fine tune how much the front sight fills in the rear notch of the rear sight. The next option will be Ramped or Patridge. Basically a ramped sight will have the face of the sight lay away from you. This ramp makes it easier to draw from a tight holster especially leather ones. In theory ramped sights can potentially be brighter since light is easily allowed to hit the face of the sight. Most combat stye sights will feature a ramped style front. 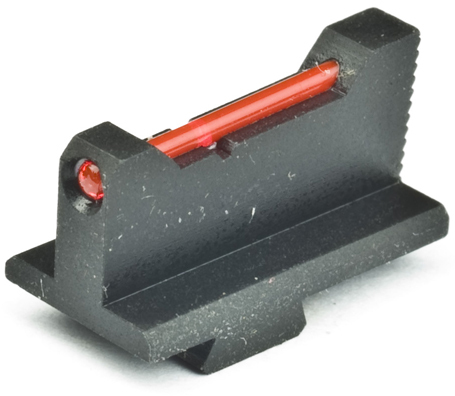 Think of Trijicon sights, the ramped front allows light to hit the white rings making them more visible. A Patridge sight will have the face of the sight sit exactly vertical or lean towards the user. In theory this allows less light to hit the face of the sight naturally blacking it out making it more crisp and defined. These type of sights are especially favored in shooting games were accuracy is needed for longer distances. But they are not as popular for combat/duty/defense applications were tight holsters are the norm. 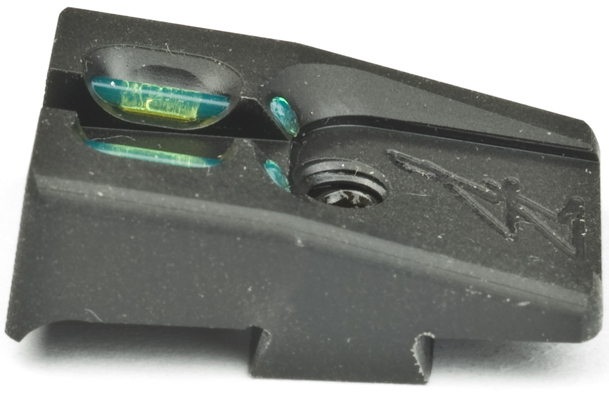 This sharp front sight can dig and catch into holsters and clothing just like a hook. 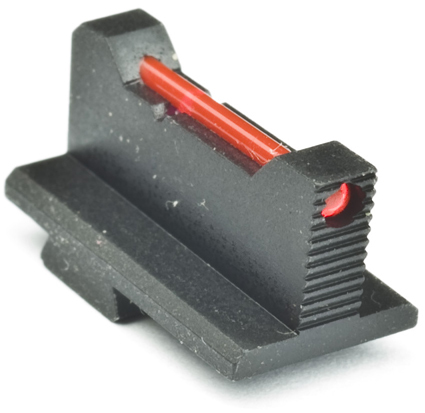 Check out the picture below of a set of Trijicon HD sights. This set features both ramped and patridge styles in the same pair of sights maximizing the benefits of both styles. 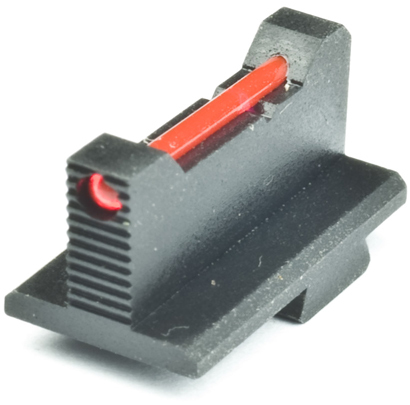 This set of SG101 Trijicon HD night sights are unique in that they feature both a ramped and patridge style sight at the same time. The front is ramped allowing the light to hit the luminescent ring of the front sight. This maximizes the brightness no matter the surrounding lighting conditions. The ramped front allows you to use this combat style sight even in the tightest of holsters without worry of getting caught. 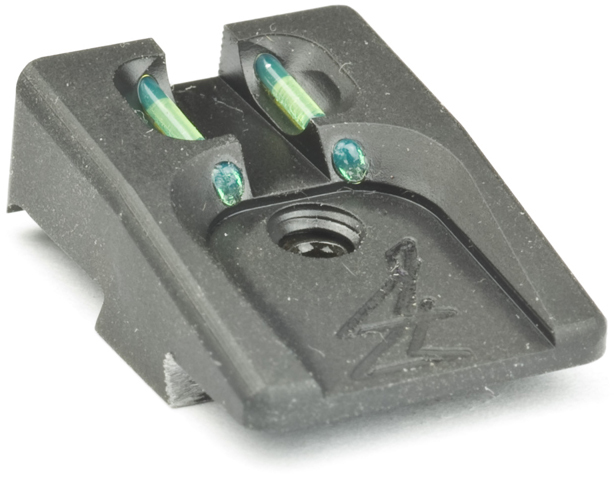 Since Trijicon utilized a patridge style rear sight less potentially distracting light can hit the face of the rear. This allows a user to focus on the bright front even easier. Here are some of the extreme options of the 021 front sights. As you can see the 021 comes in tall and short sights. It is important to order the correct height that Dawson recommends for your particular rear sight. The sights are also offered with thiner or thicker blades as well. The sights pictured above are examples of ramped front sights. Notice how the face would lean away from the user.